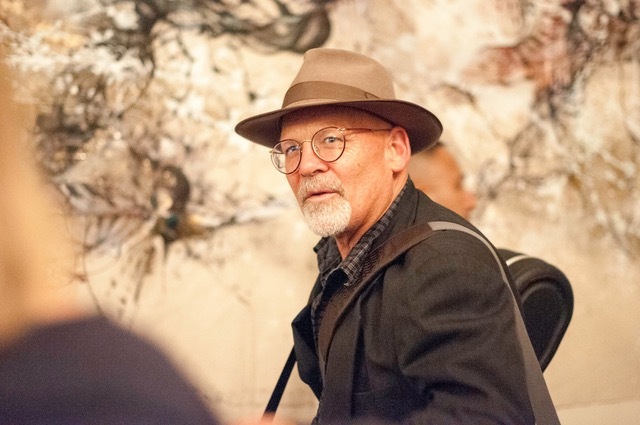 Michael Menager–Consummate Poet, Minstrel, at ArtsUp, S.F. Seated on a tall stool in an intimate 40s era living room on Nob Hill, Australian Michael Menager, American born singer-songwriter, tunes his vintage Gibson acoustic guitar. Michael sings with conviction in a rich baritone that transports us to unique places. His songs on life and love, mischievous and playful, are always framed in hard-earned wisdom. His audiences, from newlyweds to seniors, listen with rapt attention as Michael, a born storyteller, takes them on striking journeys. In the pauses between songs, guests recount their own stories, too, in the space of sharing Menanger creates. Michael is performing at an ArtsUp concert at Stella’s Salon. Stella is recreating French art salon, where women welcomed top artists, musicians, and writers. ArtsUp, the brainchild of Italian-born Andrea Carafa, has come to life in San Francisco. The concept is simple: willing hosts open up their homes, and gardens, and apartments to music, visual arts, spoken word, discussion, and one-act plays. The ArtsUp concept has expanded to Rome, London, and Madrid. The next night, ArtsUp moves to a beautiful, shared house in the Hayes Valley, San Francisco. Tamara Broner, a Human Rights Watch activist and researcher, speaks passionately about her years documenting human rights abuses in Venezuela. Her audience, mostly millennials, listens attentively, and jumps into an intensive Q&A with Tamara. And then it’s again time for music. Two young men, Italian and Mexican, play rhythmically charged songs of social commentary in Spanish, Italian, and Portuguese. Tears glisten in the eyes of the young people seated on the sofas, chairs and floor cushions that make up this living room theatre. Incubated in the folk music renaissance of the 60s, Michael Menager has followed the paths of songwriter-troubadours Woody Guthrie and Bob Dylan. His lyrics, pared down and accurate, recall John Prine, Guy Clarke, later Leonard Cohen. They resonate with us all. Michael’s song points to our essential nobility, waiting to be expressed. And with this reminder of our potential, the poet-minstrel’s work for the evening echoes in us, magically. “Roman Women”—A Hit with Intensity, at We Players, S.F.